1954 | THE MONDRIAN SERIES BY MARGARET CLARK | BIRTH OF MARGARET JERROLD INC.
Chi ha disegnato per primo calzature ispirate ai temi della pittura di Piet Mondrian? Roger Vivier nel 1965 e I.Miller nel 1961 si è detto. Prima di loro però la designer Margaret Clark nel 1954 disegnò il modello qui raffigurato. Anche in questo caso il marchio I.Miller é coinvolto perché presso I.Miller la Clark aveva iniziato anni prima la propria attività lavorativa. Who first designed a shoe inspired by Piet Mondrian's paintings? So far, we knew about the 1961 design by I.Miller and the one by Roger Vivier (1965). Somehow, the I.Miller brand is involved even with this 1954 model (that predates by a long shot the two just mentioned) since the designer, Margaret Clark, started at I.Miller her career in footwear design years before. Nel 1954 Margaret Clark aveva creato col marito Jerry (Jerrold) Miller la Margaret Jerrold Inc. e questo era uno dei disegni preparatori per il nuovo marchio e faceva parte di una serie ispirata al pittore olandese. Il disegno appartiene alla collezione donata da Jerry Miller al Fit Museum di New York: quasi 5000 disegni di calzature e materiale correlato contenuti in 27 scatole, la maggior parte degli anni ’50, creati per il marchio Margaret Jerrold e per i clienti di Margaret tra cui Capezio, Red Cross, e Joyce. 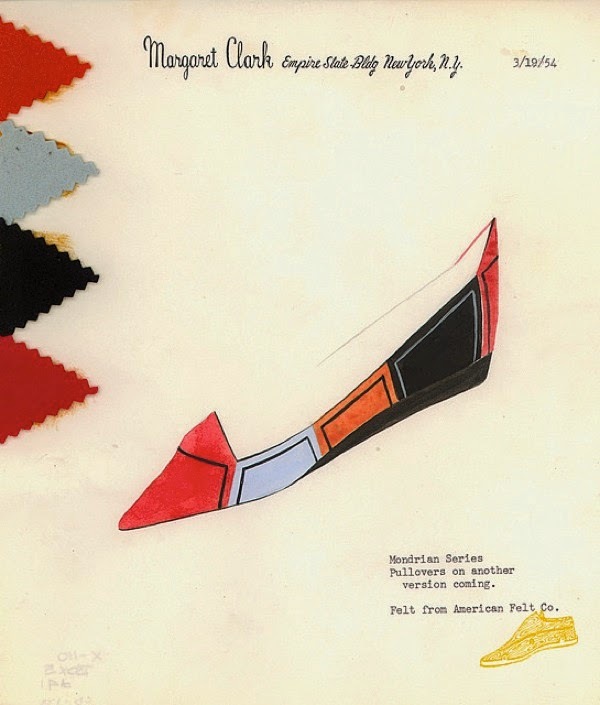 In 1954, Margaret Clark and her husband Jerry (Jerrold) Miller created the Margaret Jerrold Inc. and this was one of the sketches for the upcoming brand: it was part of a series inspired by the famous Dutch painter. The sketch belong to a collection donated Jerry Miller to the Fashion Institute of Technology of New York: 5,000 sketches (the majority from the 1950s) - and related material - spread over 27 boxes. Works for the brand Margaret Jerrold and other Margaret's clients such as Capezio, Red Cross and Joyce. I will never forget the Chicago Shoe Show in 1954. The whole world used to come to Chicago. 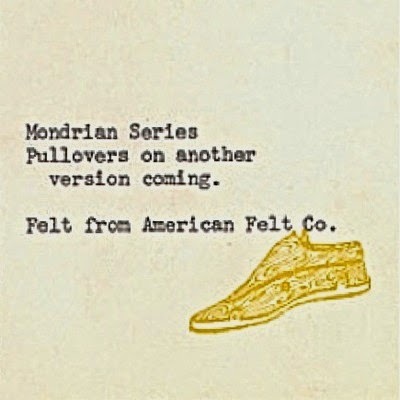 It was a tradition in the shoe industry and it was held in downtown Chicago at the Conrad Hilton and the Palmer House. … we had a little display of our eight shoes and our pullovers … there was no such thing as Margaret Jerrold - I don't even think we had a name for our company yet. We had such a revolutionary concept that the word spread. The whole shoe industry came to see us.